Everyone knows that Louisiana in the summer months is oppressively hot. The last thing you want to do when it’s that hot outside is to settle in with a nice, warm cup of coffee in the morning. But what to do? We all need our caffeine fix in the morning – how else are we supposed to wake up like a civilized human being? Cold brew coffee to the rescue! I’ve enjoyed iced coffee for a while, but I’ve recently starting making my own at home. Cold brew concentrate is the key to great tasting iced coffee. While you can buy cold brew concentrate in grocery stores, I find that making my own is quick + easy. 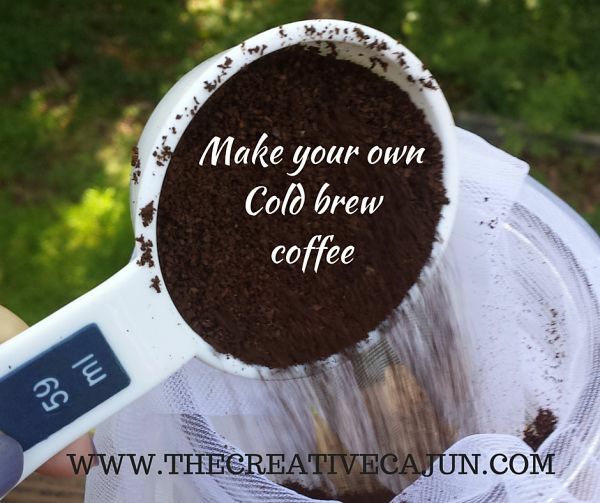 Today, I’m going to show you the steps to make your own cold brew concentrate so you can enjoy affordable, iced coffee during the summer months. I make my cold brew in quart sized mason jars using a nut milk bag as my “coffee filter”. The coffee will need to brew for 12-24 hours at room temperature. After brewing, strain the coffee grounds from the water and store the concentrate in the fridge. TIP: I compost my used coffee grounds. I love iced coffee in the summer. Thanks for the tips.